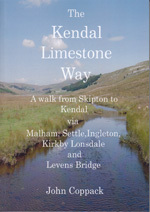 The Kendal Limestone Way is a long distance walk devised by the guidebook author John Coppack. The route taken explores the remarkable limestone landscape of this part of northern England and is the main theme of the route. Starting from the market town of Skipton in North Yorkshire and ending in the South Lake District town of Kendal, the walk can broadly be divided into three sections. 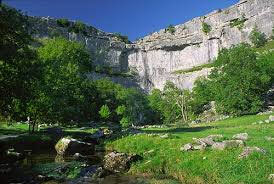 The greater part of the walk is through the limestone country of the Yorkshire Dales National Park. The second, and shortest, section crosses the lower Lune Valley between Lancashire and Cumbria. The final section visits the limestone area to the east of Morecambe Bay, the lower Kent Valley and the south-eastern tip of the Lake District National Park. Over millions of years, major earthquakes have shaken the northern Pennines creating massive geological faults and fractures. To the north of the main fault lines lie the porous limestone uplands of the Yorkshire Dales National Park where rugged hills and towering cliffs of pearl white limestone dominate the landscape. A limestone landscape is also present in the south eastern corner of Cumbria where precipitous limestone ridges form a barrier between Lakeland hills and Morecombe Bay. The route is almost entirely along field, woodland and riverside paths, canal towpaths, ancient tracks and bridleways and quiet country lanes. An average walker should be able to complete the walk within five or six days, although the guidebook describes the route in seven day walk stages for a more leisurely week long walk. Alternatively, individual sections could be walked at different times. The guidebook provides clear easy-to-follow route directions supported by 25 maps dedicated to route navigation as well as a wealth of Practical information and safety advice. Features of historical, archaeological and geographical interest along the route are highlighted and captured in 92 colour photographs. The descriptive text above has been adapted from the guidebook.